I was looking through scans with NGE and found this one. I like the way Rei is dressed it looks cute and it is casual as well. In addition , Ayanami has a happy look in this scan. I thought about smth very calm and a little bit retro. 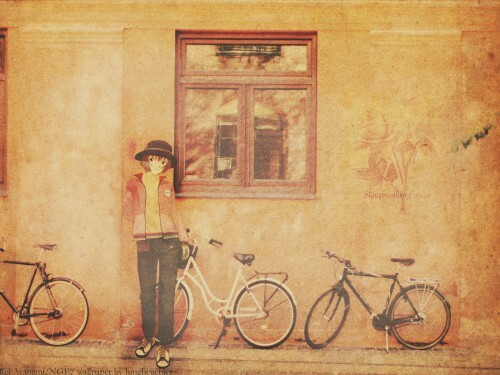 I like to match photos with pics, so a photo with several bicycles in front of some old building seemed to suit Rei. Well, Ayanami was very lonely so I thought that if she were standing alone among several bikes it would look appropriate. I wanted to save some original colours and didn't make the wallpaper all sepia. I added a little picture of rose on the wall so that it wouldn't distract the attention from Rei but would add some softness to picture. So this is what I've got. This looks realistic. But her face looks a bit different. Wow so artistic ;) Thanks for the hard work! Rei is so cute here! Wow! I love it....Sooo Ancient. Rei + those bicycles = genius. I really like the textures for this; very retro.